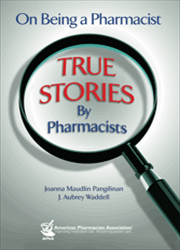 On Being a Pharmacist: True Stories by Pharmacists is a compilation of stories, essays, and vignettes, pharmacists present recollections of encounters with patients, colleagues, pharmacy teachers, and other health professionals that had a great effect on their life or practice, and they share their humorous experiences in pharmacy practice. "This is an original collection of stories that lets the reader feel the experiences of the pharmacists and situations that have an influence on their pharmacy careers. The scenarios discussed provide opportunities for the reader to self-reflect on the situations they experience and the feelings that result." Pharmacists, student pharmacists, and their families will enjoy and relate to these personal reflections. The contributed stories will provide valuable insight into the joyous, and sometimes painful, aspects of pharmacy practice.